For doing every work you need commitment, for commitment will power is definitely needed. For doing simple tasks also will power is needed, when getup from bed in early morning, you fell like lazy and unlike to move from bed is the simple example for lack of commitment and low will power. To achieve any thing in life will power is needed. When person is fail to achieve goals in their life because of low will power. Stress & anxiety also some reasons for low self esteem. When person is having will power they can able to do any kind of work with out any discrimination and any delay. Physical activity (or) Exercise is not not only help full to your heart and lungs and body but also your brain it releases endorphin hormones which will up lift your mood. Means physical activity help you not only in physical it will help you in emotionally also. Here in this article we presented some simple ways which helps in improve your will power. 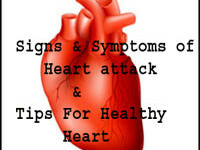 You Can Also See : Types,Common Symptoms and Preventive measures of Diabetes. If people are fail in to achieve any thing in their life means the main reason is they are not set prior and attainable goals in their task. Goal is very help full in attaining goal in life. The goal should be in a specific terms and it should be attainable and fix time, these are the characteristics of goal. If you want achieve any thing means don’t take it as whole. First dived it in to small tasks and fix some short term goals to each task. If you get success in first task definitely you will get some confidence and will power to do next task. Setting goals will helps in increasing your will power. It is the one of the best way to boost your will power. When you are accountable for in your own life and you will find some reasons which will effect your life style, definitely you will kick all of the disturbances in your life and your will power also increase. Enough rest is important , every person need to sleep 7-8 hours night sleep. When you sleep well than only your thinking capacity is going to improve.When your thinking capacity is improved than your problem solving skills are going to increase, It will helps in achieve goals in your life. Regularly doing exercise is help full to body. And it is a powerful antidote for stress and anxiety. So regularly do exercise at least 30-45 minutes daily to keep stress and anxiety away. Because of meditation and yoga your concentration capacity is going to improve. It will unleashing your powers especially your will power. So practice few minutes of mindfulness is help full in improving your willpower. Good nutrition is not only helps your physical health, but it will also effect your mood. First you must know what kind of food you want to eat and how it will effect your body and mood. So have good and balanced diet, avoid junk food. Have more vegetables and green leafy vegetables and fruits and nuts more in your diet. You Can Also See : Main Reasons to have Dollop of Ghee in your Meal Daily. Sun light lift your mood so try to get enough sun light from sun. Try to go at least 10-20 minutes sun light. Which helps in emotional health & lift your mind. When you fell excessive extreme stress go for bath or drink more water . Which helps in reduce your stress and increases your will power. It will purify your blood also which helps in maintain hormonal balance. Avoid alcoholic and coffin substances which having long negative consequences in your emotional health and mood.So avoid these substances to keep your emotional health in good condition. 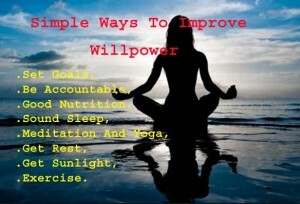 These are the some of the simple ways which will helps in improve your will power and self esteem levels. If you like this article you can share it to your friends who are having low self esteem levels to solve their problem. I think this should be use full to you. thanks for reading this article.